“…you say that it is more on-the-spot then your other carefully constructed books but just how on-the-spot was it? 1) CARNET was my diary — documented day-by-day as dated (or at least the day after). 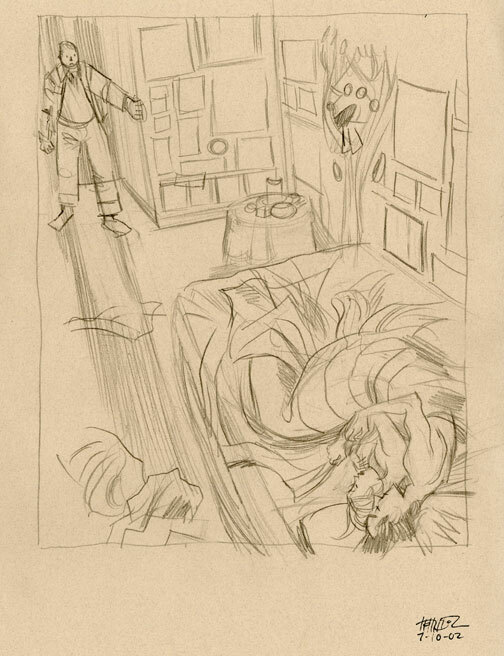 2) Portraits and landscapes and full-page illustrations were drawn on location. Again, no photo reference. — standing in the most uncomfortable positions getting sun-burnt and harassed and nearly run over by motor bikes. I would draw things “in real time” and leave empty space on the page for journaling text. 3) The comics narrative part of the book was constructed during a more comfortable part of the day or the next morning. bathroom – journaling about my awkward interactions with locals. pages the next day, aboard the long train ride back to Marrakesh, while sandwiched between other travelers. 4) EDITING. Any and all of it happened between the 15th and 24th of May at my friends Laëtitia & Frédéric’s home in Lyon, France. I’d left them with my first two sketchbooks when I departed for Barcelona, and they’d scanned all the pages by the time I returned. 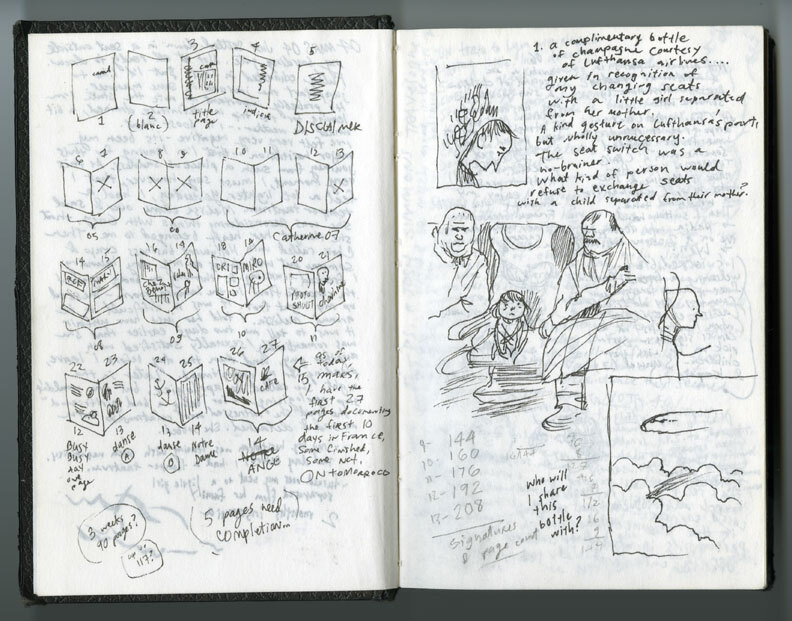 Then there was one last sketchbook for scanning, proof-reading (with non-native English speakers!) and minimal digital construction. 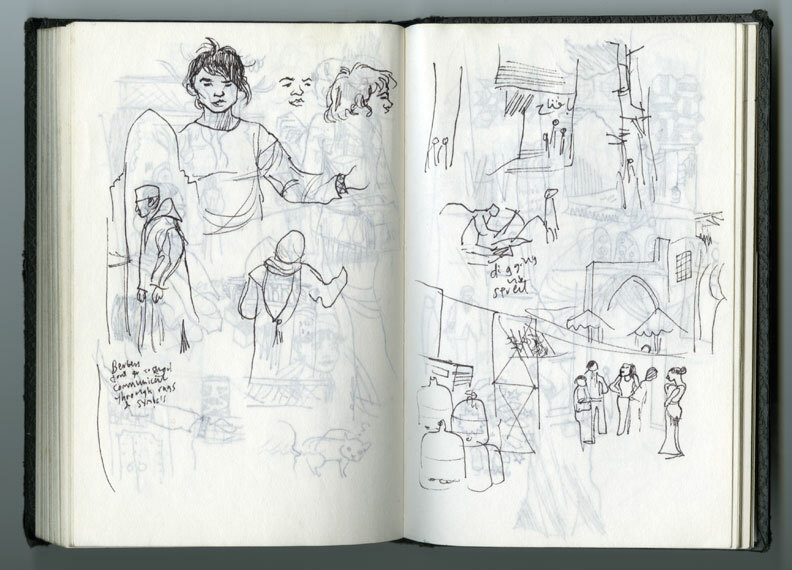 because I wanted to squeeze drawings from separate sketchbooks onto the same page. adventure of drawing the book while on the road. Every cartoonist should give it a try! for being there — for reading the books and your encouraging comments! 1) mindless doodles, circa 1999. One day, the “flaming meanies” will be resurrected. from January 2001 to capture a trip yet to happen in March 2004. Joba and Vanessa asked about what European cartoonists inspired me. When I was first went to Paris in 1995 for a community college art scholarship, I scoured the bande dessinée shops and was disappointed to find that France had a glut of science fiction and fantasy books like the US has superheroes. 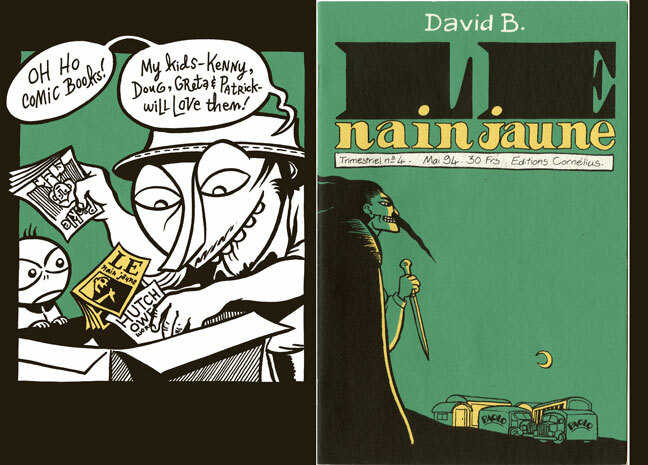 Then I stumbled upon a series of 24 page pamphlets published by Cornelius, including David B.’s Le Nain Jaune. I constantly poured over David’s work, and included it (along with Dylan Horrocks and Tom Hart) in Chunky’s sacred stash. 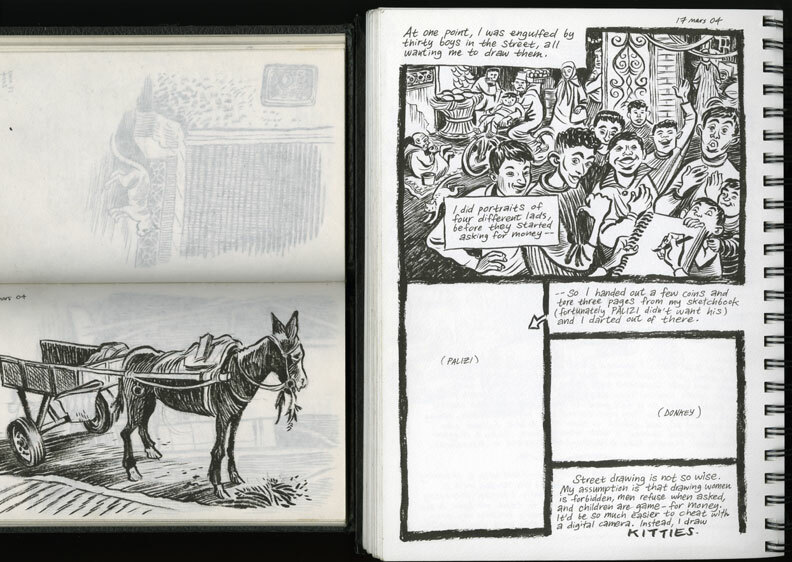 His epic Epileptic is translated into English and may be my favorite graphic novels ever. The first French cartoonist whose work I was able to appreciate in English was the inspired Lewis Trondheim. 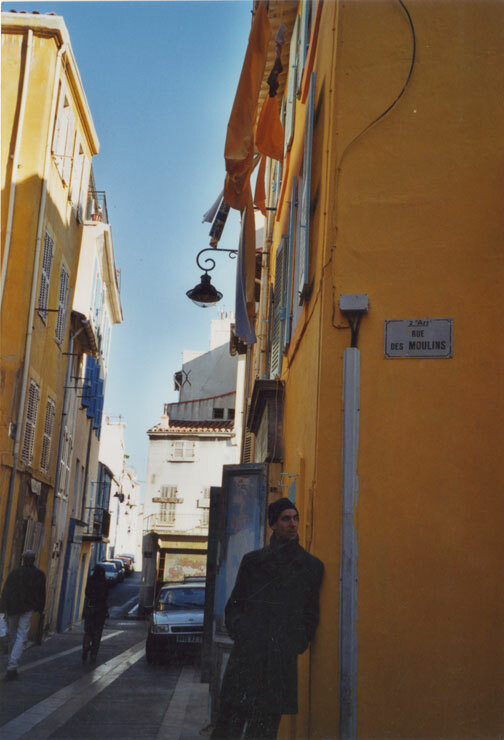 We met during his US tour in 2000 and he was generous enough to invite me to visit him in Montpellier in early 2001. 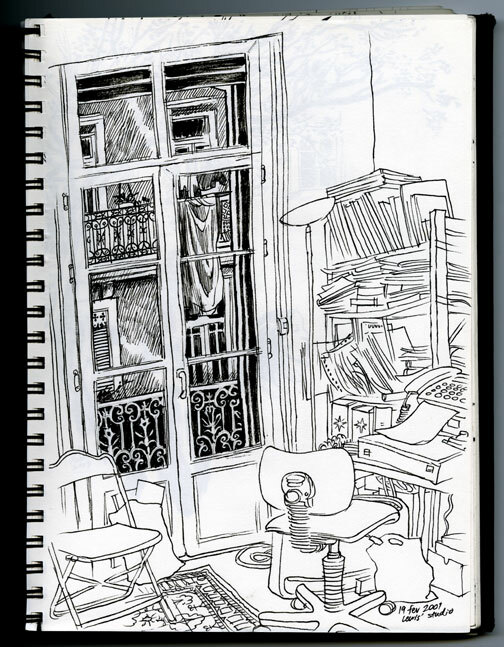 Here’s a sketch of his studio then. Of course, you’ll see more of him in the pages of my Carnet. Also seen in Carnet is Blutch. I am a slobbering fanboy for his virtuoso drawing. My work has been criticized for ripping off his style; and while the influence may be apparent, I am an amateur in the shadow of this master. Unfortunately, only short pieces of his have been translated to English in the Drawn & Quarterly anthology. Another master is Baudoin. We met at the Haarlem comics festival outside of Amsterdam. He was vibrant and full of energy, dancing and sketching everywhere. Watching the lines flow from his brush is fairly heartbreaking. We had an enthusiastic and clumsy conversation in our foreign tongues, and Baudoin drew this doodle on the left side of my sketchbook to describe the experience of moving away from his hometown of Nice. 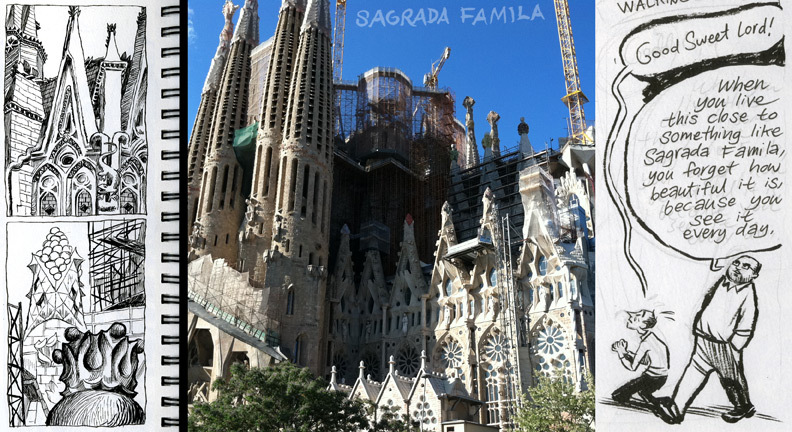 On the right, I scribbled out my own story that brought me to France. I’ve spent enough time in Paris now that I’ll randomly run into people I know in the streets. This happened once with Charles Berberian on his birthday along the canal. Charles always impresses me with his kindness and pure “well-adjustedness”, in contrast to us neurotic American cartoonists. Lucky for all us monolingual Americans, his and Philippe Dupuy’s work has been published in two pretty volumes from Drawn and Quarterly: Get a Life and Maybe Later. Here’s Charles (right) and my Dutch publisher “Uncle” Hansje (middle) in the Netherlands. One French cartoonist I’ll never have the chance to meet is Aristophane who tragically died at age 37. His “heaven” book Les Soeurs Zabîme and “hell” book Conte Démoniaque give me the shivers. More thanks to all of you for the comments and support. I’ve done a poor job of responding to any questions, so here’s to catching up on some of them this sweltering Friday the 13th evening in Portland. Kesher asked about a Spanish Chunky Rice. Tanwer and Salakov are right. Chunky should be available in Spanish from Astiberri any day. Ngam, Flescetto, Smoky Man, and Liz asked about potential signings in Paris, Italy, and Chicago. I’ve nothing scheduled for the rest of the year, making myself sparce on the promotion circuit. For a while, I was spending all my time signing books rather than starting on a new one, so I’m trying to stabilize at home. My drawing hand needed the rest, too, but I sincerely miss interactions with you loyal readers. That’s one reason I’m grateful for this blog. When HABIBI is finished, I’ll likely tour for a year. 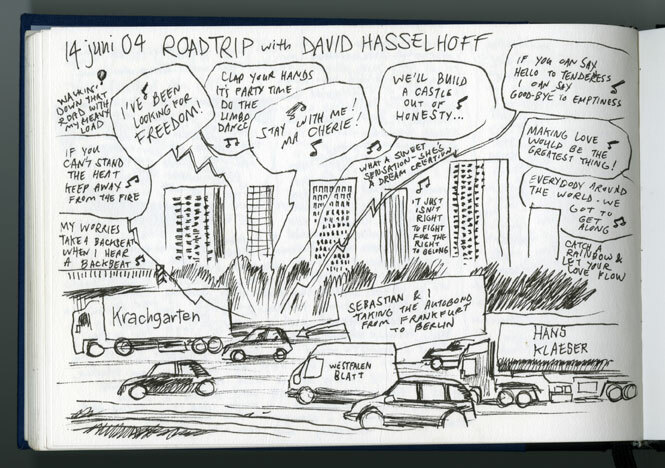 Here’s a slice from a signing tour in Germany when my editor/publicist Sebastian purchased David Hasselhoff’s GREATEST HITS as our Autobahn soundtrack Frankfurt to Berlin. Ben Bishop asked about Nickelodeon magazine. Best for new cartoonists to simply submit directly. I lucked out. While working as a graphic designer at Dark Horse comics, I snuck some of my own illustrations into ads and indicia pages. It was against company policy, but the editors of the SCATTERBRAIN humor series encouraged it. 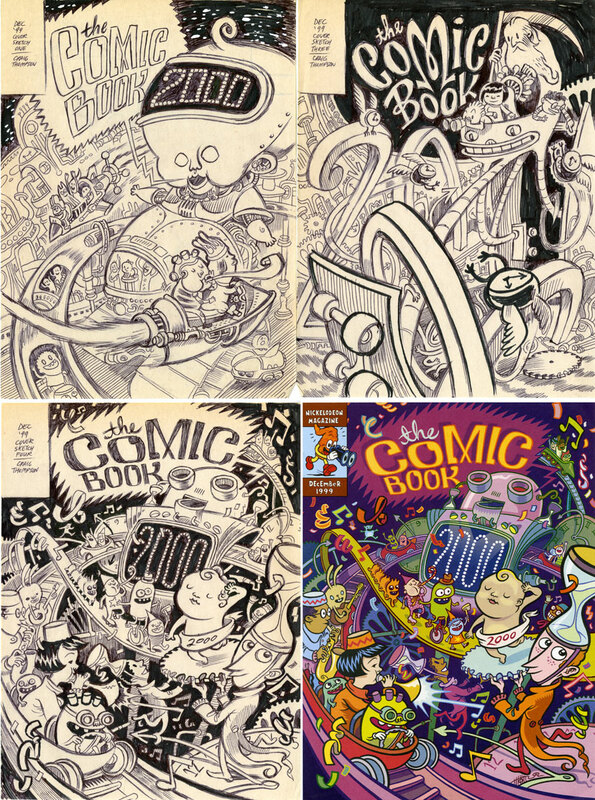 After seeing these said illos, Chris Duffy at Nickelodeon contacted me about submitting to the Nick COMIC BOOK. At first, I focused on one panel gags and later graduated to full-page comics. Editors Chris Duffy and Dave Roman are glowing heavensent angels of the comics industry. They are almost solely responsible for economically fueling me through the production of Blankets via monthly comics and illustration gigs. Here’s a peek at a new millennium cover for them and the preliminary ballpoint pen roughs. Ngam ~ My birthday is actually September 21, 1975 as seen on the CARNET passport. Emily asked if I still believe in God and Jesus, but I think I’ll defer that question for this forum. Jesse Cohn pondered self-nurturance versus self-denial in Rumi’s poetry, which is a juicy and exciting topic, but too much for tonight’s typing. Open discussion for both! Sorry for the late response to Maria asking about the Cure and Tom Waits references in BLANKETS chapter titles. Yup, you got them right. Jaybird asked about my HABIBI working day. 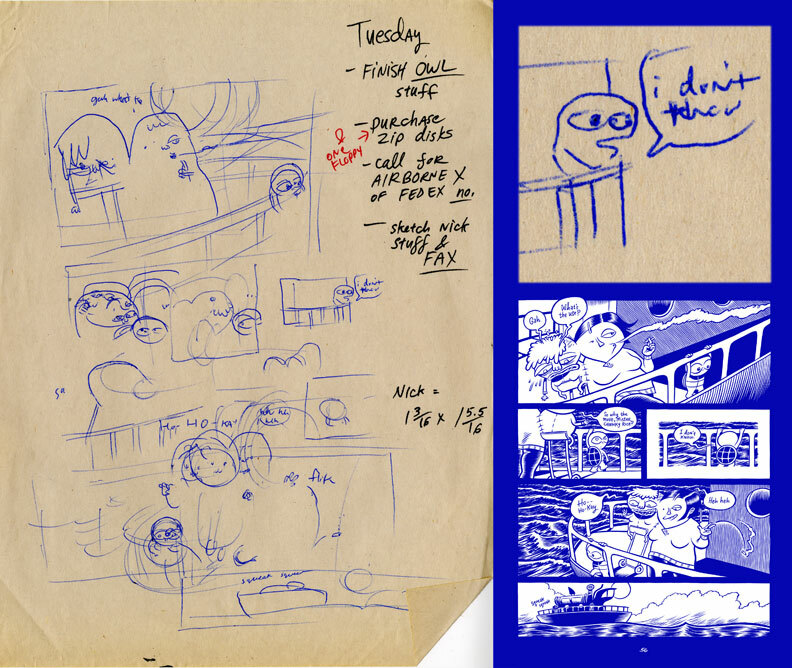 The entire book was storyboarded in thumbnail form. The first draft was completed in summer 2005, but then I tinkered with it and got lost an insecure creative block until a late 2006 revision. Except for much of Carnet, I definitely pencil before I ink. It’s a great stage for working out compositions, but it often hurts the integrity and fluidity of the final line. In the future, I hope to draw a book with ink straight to paper like many of the inspiring European cartoonists, but for now, I’m not “masterful” enough to get away with that on HABIBI. Of the six hundred pages, I feel fairly good about the first two hundred, the second third will require some editing, and the last part of the book will likely be tossed out and rewritten. I haven’t yet “solved” the story for the main characters, because I haven’t sorted out the same issues in my own life. 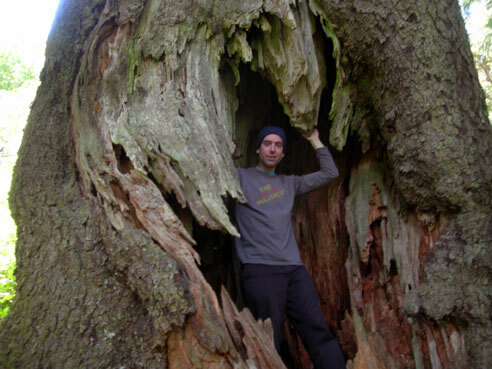 Here’s a picture of me living inside a tree.